NASA's planet-hunting Kepler space telescope detected 1,235 possible extra-solar planets during its first four months of operation, astronomers announced Wednesday, including 68 approximately Earth-size worlds. 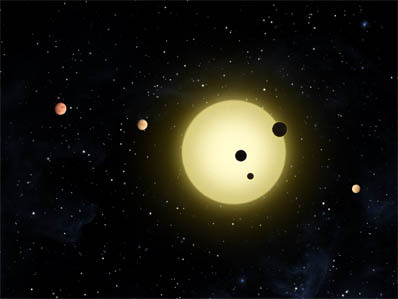 Five of those are orbiting in the parent star's habitable "Goldilocks" zone where liquid water could exist in environments favorable for life. The planetary "candidates" must be confirmed by additional observations and analysis and it will take another two years to collect enough data to determine how common Earth-like worlds might be. But based on the initial results, "Kepler's blown the lid off everything we know about extra-solar planets," said Debra Fischer, an astronomer at Yale University. Launched from Cape Canaveral on March 6, 2009, Kepler's 95-megapixel camera is aimed at a patch of sky in the constellation Cygnus that's the size of an out-stretched hand, a 10-degree-wide target zone that contains more than 4.5 million detectable stars. Of that total, some 300,000 are believed to be the right age, have the right composition and the proper brightness to host Earth-like planets. More than 156,000 of those, ranging from 600 to 3,000 light years away, will be actively monitored by Kepler over the life of the mission. The spacecraft's camera works like a photometer, continually monitoring the brightness of target stars in the instrument's wide field of view, on the lookout for subtle changes that might indicate a planet passing between the star and the telescope. By studying those changes in brightness -- comparable to watching a flea creep across a car's headlight at night -- and by timing repeated cycles, computers can identify potential extra-solar worlds even though the planets themselves cannot be seen. But it's a challenging observation. For a planet like Earth passing in front of a star like the sun, the star's light would dim by just 84 parts per million, or less than 1/100th of 1 percent. To make sure an observation indicates the presence of a real planet and not some other phenomena, measurements over multiple orbits are required, along with observations using large ground-based telescopes. For Earth-like planets in habitable-zone orbits, a full three years will be needed to confirm an initial observation. The data released this week covers the first four months of Kepler observations between May 12 and Sept. 17, 2009. "We found 1,200 candidates in this single field of view," said William Borucki, the Kepler principal investigator. "Imagine that we had that field of view covering the sky. Kepler looks at a 400th of the sky. If we had 400 of these fields of view, we'd see 400 times that number of candidates. We would see 400,000 candidates. "What that's telling you is the stars around us have a huge number of planets and candidates for us to look at. And if we find that Earth's are common ... in the habitable zones of stars, very likely that means life is common around these stars. Kepler is the first step in mankind's exploration of the surrounding galaxy to find life, and the extent of life, in our galaxy." Before today's briefing, the Extrasolar Planets Encyclopaedia maintained by the Paris Observatory listed 519 planet candidates beyond Earth's solar system, including nine discovered earlier by Kepler. 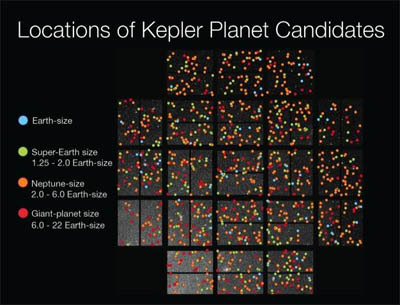 Last year, the Kepler team announced 700 planetary candidates. The Kepler total now stands at 1,235 candidates, with 15 confirmed planets. The candidates unveiled this week include 68 Earth-size planets, 288 so-called "super" Earths, 662 Neptune-class worlds, 165 roughly the size of Jupiter and 19 bodies much larger than Jupiter. Fifty-four candidates orbit their parent stars in the habitable zone and 170 stars feature multiple planets. Of the 54 candidate planets orbiting in their stars' habitable zones, five are roughly the size of Earth. But all of them orbit much closer to smaller, cooler stars than the sun. For Earth-like planets around sun-like stars, three years of data covering multiple orbits will be needed for confirmation. "The fact that we've found so many planet candidates in such a tiny fraction of the sky suggests there are countless planets orbiting sun-like stars in our galaxy," Borucki said in a NASA statement. "We went from zero to 68 Earth-sized planet candidates and zero to 54 candidates in the habitable zone, some of which could have moons with liquid water." On the lookout for double star systems that could result in false readings, Kepler also has identified 1,879 eclipsing binary stars. In addition, the spacecraft found one star system -- Kepler 11 -- with six confirmed planets orbiting close to the parent sun. If transported to Earth's solar system, all six would fit inside the orbit of Venus. 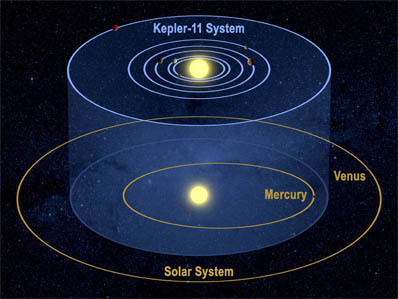 "Kepler-11 is a remarkable system whose architecture and dynamics provide clues about its formation," Jack Lissauer, a planetary scientist and Kepler science team member, said in a NASA statement. "These six planets are mixtures of rock and gases, possibly including water. The rocky material accounts for most of the planets' mass, while the gas takes up most of their volume. By measuring the sizes and masses of the five inner planets, we determined they are among the lowest mass confirmed planets beyond our solar system." All of the Kepler-11 planets are larger than Earth. "This, of course, is an amazing era of discovery for astronomy, for exoplanets in particular," Fischer said. "There's no doubt that the search for planets is motivated by the search for life. Humans are interested in whether or not life evolves on other planets, we'd especially like to find communicating, technological life, and we look around our own solar system and we see that of all the planets, there's only one that's inhabited. "Naturally, we think that finding another Earth-like planet is identifying a site that's at least friendly here for the evolution of life. The primary goal of the Kepler mission is to statistically assess the occurrence of these small terrestrial worlds." Fisher said when Kepler launched, astronomers expected "planets would begin to roll out of the Kepler mission like an assembly line." "The first year, we could expect to see Jovian-mass planets and after two or three years we'd see the Neptunes begin to roll out and then finally, the Earths. So I'm amazed to sit here today and see Kepler is actually reaching the milestone discoveries faster than I anticipated."